I read to my little girl all the time and she loves it! So you can imagine how excited she was when she saw her face as one of the characters in a book! The look on her face was priceless and I wish I had a camera to capture that very moment. Thanks to Little Bunny Press who made us this special book! Little Bunny Press is a family owned boutique publishing company that writes, illustrates and prints custom children’s books. Their books don’t just tell a story -they tell a story about your child, friends and family. Their goal is to provide books that allow your child to be inspired and educated by including him or her right in the storyline. I think this is a very cool and unique concept. This is a Canadian (yay!!) company located in Quebec and they can ship anywhere in North America. They are also environmentally conscious as they only print on recycled paper that has been manufactured with sustainable wind energy. I always love to support a company that cares for our environment. I received the book Around the World! : Bridget’s Continental Safari. Bridget is my 4 year old little girl. Bridget’s name and picture is throughout the book and she is the main character! This is a very well written and interactive book that asks your child questions throughout to keep him or her engaged. Bridget thoroughly enjoyed this story and got a kick out of seeing her name and picture. She can recognize her name now so she was quick to point that out to me. It was also beautifully illustrated with bright colour pictures with Bridget’s face throughout on body of a fictional character. 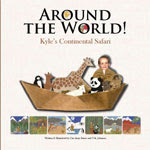 The book we received was about animals around the world so it was educational as well. Bridget loves this book and wants me to read it to her pretty much everyday. It’s something we will keep for a very long time. The process to get a book like mine is pretty straightforward. You simply upload a photo to Little Bunny Press website and then you choose a story. Then you place the face on the characters and you can customize to fix skin colour and other details. The books cost $17.95 which is a great price for such a special customized book. To purchase, please visit Little Bunny Press.